Want to make bath time more exciting? Add some glow sticks and turn off the lights. 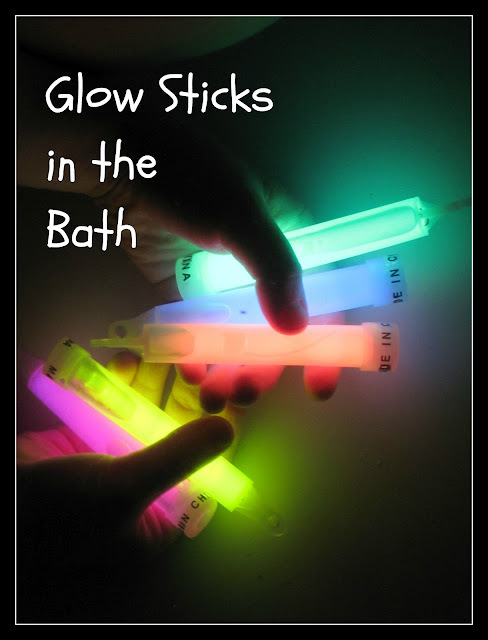 My daughter had a blast taking a bath with glow sticks for a couple nights in a row. We bought our glow sticks in the party section at Target and they were the best kind I've tried so far and they lasted the longest of any that we have purchased. They kind of just bobbed around in the water at first. They were just fun to look at and swish around in the water. My daughter had races with glow sticks and pretended that they were fish too. All I know is that she had loads of fun! Such a cheap and easy way to add fun to bath time. The fantastic blog: Growing a Jeweled Rose inspired us to have some glow in the dark fun in the bath!